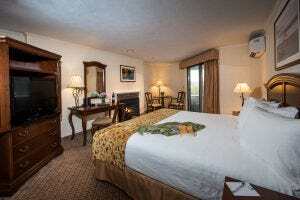 Cozy and comfortable – a fireplace suite at our hotel adds a little extra to your Ogunquit getaway. Located in the West Meadow building, close to the pub and overlooking the outdoor pool, our fireplace suites feature a king bed and in room gas fireplace. A simple touch for your couples retreat. Stroll from our hotel down Obeds Lane and arrive hand-in-hand at the entrance to Marginal Way within minutes. Visit the boutique shops along Shore Road and just enjoy a central location to relax together. Tee & Sea golf getaway with hotel room, round of 18-holes at the Links at Outlook Farm and dinner at the Farm-to-Table Jonathan’s Restaurant. Learn to Surf or Paddle Board package with overnight accommodations, spa treatment and your choice of a surfing or paddle board lesson with all gear included. During your vacation, breathe the ocean air and enjoy Ogunquit Village and Perkins Cove – both are walking distance from our hotel. Your stay in our contemporary European-styled fireplace suites provide that extra touch you want for your romantic getaway.